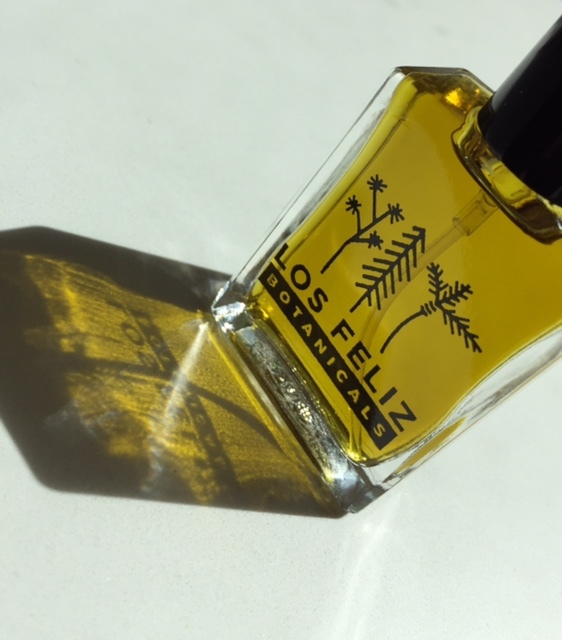 Los Feliz is a neighborhood in Los Angeles, not too far from where I went to college, so when the PR gal from Los Feliz Botanicals contacted me, my interest was instantly piqued. When I learned that Krystal Quinn Castro, the creator of LFB, studied with Mandy Aftel, my interest was piqued even more and I knew this was a line I needed to explore. For this LFB feature, I have done a YouTube review which is at the end of this post, but I also wanted to share photos as well as brief reviews here on my blog. I hope you enjoy! Upon first receiving the samples, I was impressed with their presentation. 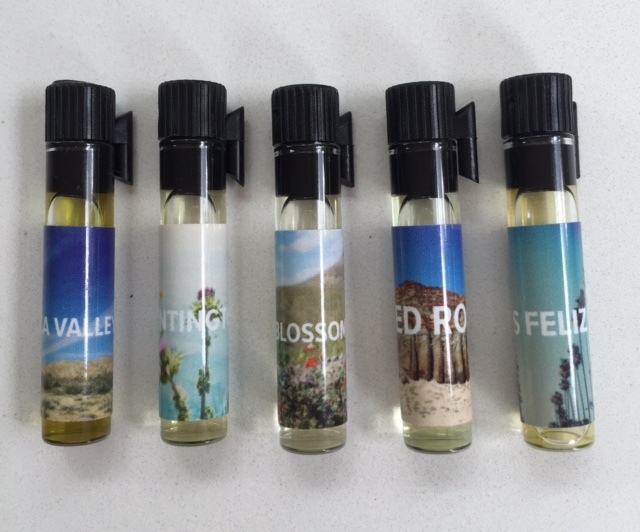 I’m sure it’s got to be a difficult task to make samples look interesting and fresh, but LFB managed to do so with tiny little photos depicting the inspiration for each fragrance, and a modern font to label them. The business card is lovely as well, but it also serves to inform you of the fragrances when you it flip it over. It’s not often that I enjoy wearing the entire line from a perfumer, but each one of these LFB perfumes is one that I would happily purchase for either myself or as a gift. 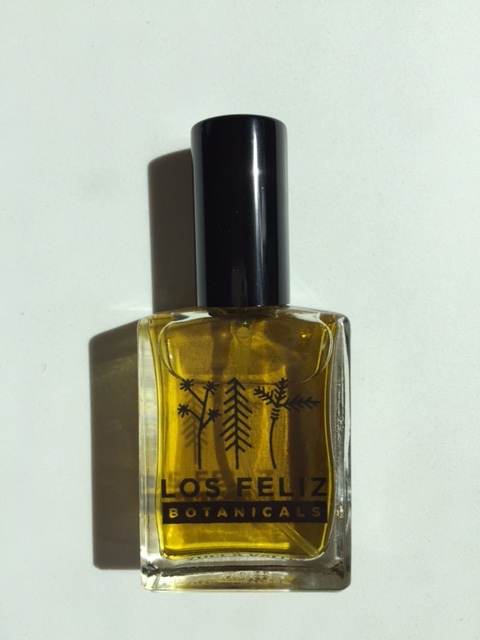 Their eponymous fragrance, Los Feliz, is the crowd pleaser of the bunch as it’s a soft ambery jasmine floral that is as smooth as it is juicy. It’s touched with a tinge of ginger and dries down to a gorgeous honeyed vanilla. I adore this one! It was difficult to choose, but Yucca Valley was my favorite of the five. As you might have read, I’ve been very drawn to roses this summer and it looks like that fascination is not waning anytime soon. Yucca Valley is redolent of roses. Leathery, tobacco laden roses that are perfect for the approaching fall weather. I know this image has become quite rote in the perfume world, but I can’t help but say this is a “curl up by the fire with a cup of tea” kind of fragrance. Red Rock took me a few wearings to warm up to, but in the end, I have come to love this one. Unlike Yucca Valley which is a supple suede leather fragrance, Red Rock is a dry and cracked leather, which initially felt less approachable to me. But once I engaged with the rich sage that weaves in and around the perfume, as well as the lavender and earthy notes, I realized it was much deeper than I first experienced, making Red Rock the most complex of the offerings. Huntington might be the most straightforward perfume in the LFB lineup, but if you are a violet lover, this is a very good thing. To me, this wears as a violet soliflore, and a gorgeous one at that. It’s not too sweet, not too green, and has just enough resin to keep it grounded. Not that this is a woody floral, again, this is all about the violet. But there is a hint of balsam, linden and mimosa to enhance and support, giving the violet its perfect backdrop. Finally we have Blossom Trail which features neroli, bitter orange, frankincense and a touch of cognac. If I didn’t already have so many neroli fragrances in my collection, this might have been my full bottle pick. It’s really fresh and reminds me of spring in Phoenix when the orange blossoms are bursting with their intoxicating fragrance. The drydown does evolve into something different though, as the booziness of the cognac edges itself into the foreground and the frankincense too becomes more prominent, like an orange blossom infused liquor. Another perfume that will transition beautifully from summer to fall. 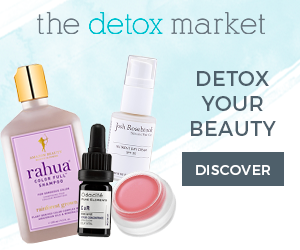 LFB has generously extended a 20% discount off a full sized bottle to my readers. 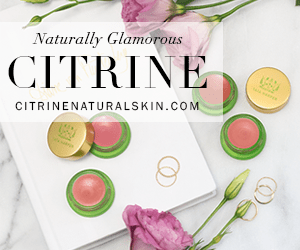 Use code SCENTHIVE20, good until Oct. 1, 2016. 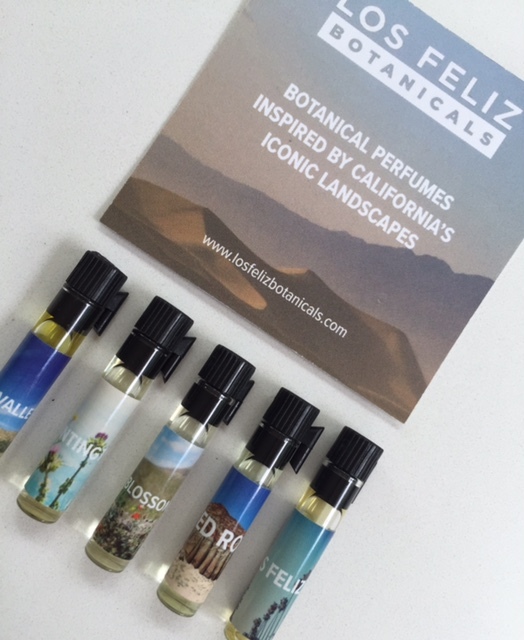 All of these fragrances are 100% natural and are available at Los Feliz Botanicals. $55 for 15ml spray bottle. $16 for EDP Kit. 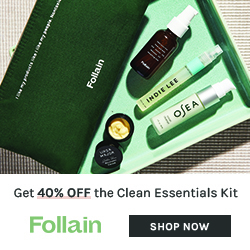 Disclosure: LFB samples were sent to me by the brand for consideration. All opinions are my own and I am not financially compensated for my reviews. Previous Post Favorites From Summer. The Extended Version. Hi Trish! These sound lovely – I’ll check them out! Thank you for the reviews and the video.